(Galerie Pierre, Paris). (Pierre Matisse Gallery, New York). (Stephen Hahn Gallery, New York). Joseph H. Hazen [1898-1994], New York, by 1966; gift 1970 to NGA. Provenance prior to donor per deed of gift. Paintings and Sculpture from the Hazen Collection, Fogg Art Museum, Cambridge, 1966, brochure no. 81. Les Tentations de Bosch ou l'Éternel Retour, Museu Nacional de Arte Antiga, Lisbon, Portugal, 1994, no. 48, repro. Extended loan for use by Secretary Alphonso Jackson, U.S. Department of Housing and Urban Development, Washington, D.C., 2004-2008. Extended loan for use by Secretary Steve Preston, U.S. Department of Housing and Urban Development, Washington, D.C., 2008. Dada e Surrealismo riscoperti, Complesso del Vittoriano, Rome, 2009-2010, unnumbered catalogue, repro. 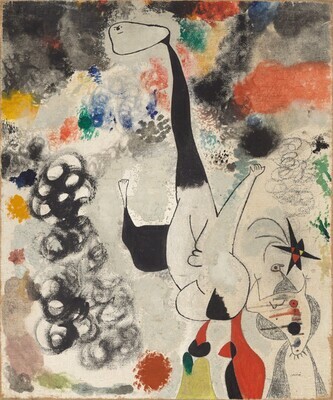 Joan Miró: The Ladder of Escape, Tate, London; Fundació Joan Miró, Barcelona; National Gallery of Art, Washington, D.C., 2011-2012, not in catalogue (shown only in Washington). The Colour of My Dreams: The Surrealist Revolution in Art, Vancouver Art Gallery, 2011, unnumbered catalogue, repro. Encounters with the 1930's, Museo Nacional Centro de Arte Reina Sofía, Madrid, 2012-2013, unnumbered catalogue, repro. European Paintings: An Illustrated Summary Catalogue. National Gallery of Art, Washington, 1975: 234, repro. European Paintings: An Illustrated Catalogue. National Gallery of Art, Washington, 1985: 270, repro.